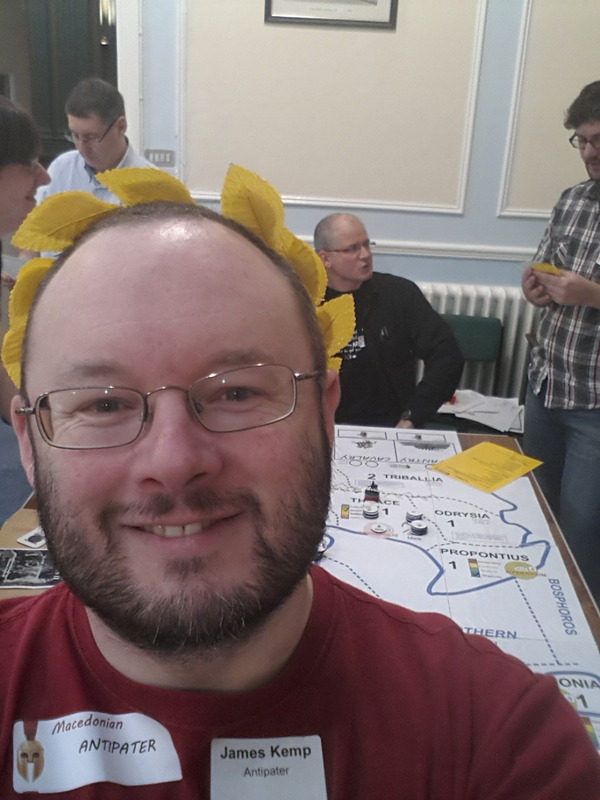 Today I played in the Megagame Makers ”Funeral Games II” which was the second outing of a classic Megagame of what happens after Alexander the Great dies. As such it involves a mix of military operations, politics and personal relationships to cement power and block others from achieving it. My starting role was as Antipater, one of three regents agreed by Macedonian Assembly in Babylon in the days following Alexander”s death. Antipater was the Governor of Macedonia, Regent and Strategos of Europe and Head of the Hellenic League. The only person with more legitimacy than him to command is Perdiccas, another Regent who is in Babylon with Alexander”s body and the two Kings (Philip III and Alexander IV). Ensure the unity of the Empire and the supremacy of Macedonia. Crush the Greek Democratic revolt. Maintain the Offices you already hold and pass them on to reliable and experience men on your death. Increase your prestige and dynasty by all means, including the marrying of your daughters to other powerful and influential Macedonians. For three years I had a very intense game. I stormed three Greek cities and garrisoned them with Macedonians. Built a city in Boeotia in honour of the fallen Lysimachus and sacked Corinth as an example. With Greece pacified and the Democrats sorted out I managed to marry my three daughters. The eldest married Craterus, the third regent, the next Autodicus who was the brother of the fallen Lycemachus and a loyal subordinate. The youngest married Siccas who was another loyal follower. The marriages were more than just convenient, they made sure that the sons in law were allies and they couldn”t attack my faction.rnrnI held an assembly in Pella, the capital of Macedonia, and decreed that the kings should return as should Alexander”s body for a proper burial alongside his forebears. I also gave a province to one of Queen Olympias”s Generals to clear him out of Macedonia. All was well and I had achieved my objectives. However, I returned to my room and died in my sleep at the ripe old age of 78.